The Old Friendship Baptist Church in southwest D.C.
As I’ve ridden bikes around the city over the past few years, I have taken notice of a number of D.C. churches for a various reasons – their architecture, their history, or their role in the community. I’ve also come across some churches that caught my attention because of the church’s unusual name. But on a recent ride I found a church that is unlike any other I’ve seen before. 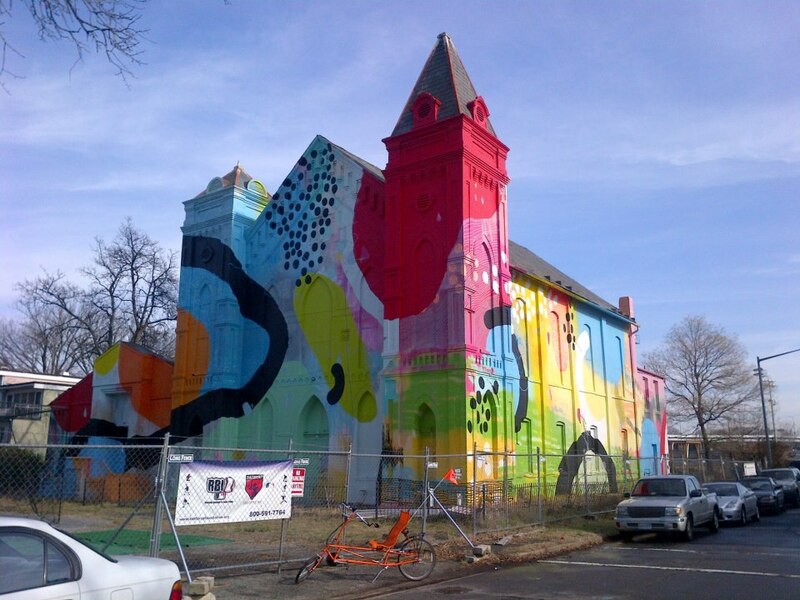 The old Friendship Baptist Church building, located at 700 Delaware Avenue (MAP) in the Southwest Waterfront neighborhood of D.C., is an abandoned church building built in the late 1800s by James A. Boyce, which has recently been used as a canvas for a contemporary street art exhibition. Created by an Atlanta-based artist known as HENSE, the large scale composition features all sorts of sprayed elements, large dots, stripes and a wide array of colors. The end result is a mixture of color and pattern with a mural style all on the exterior of the building. 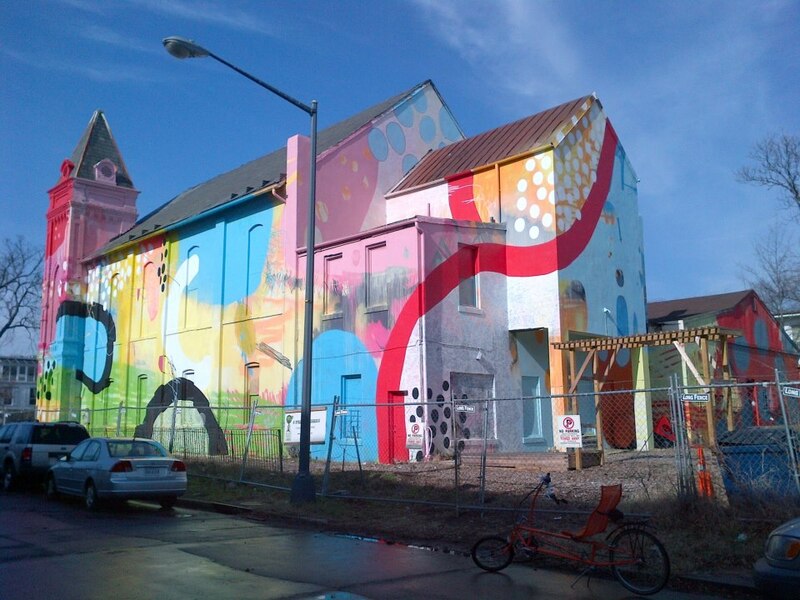 The mural installation was a private commission by an arts club named Blind Whino, and is located directly across the street from a planned museum for emerging artists, a hotel, and other hot spots in this up and coming area of D.C. The day I found this church was a near perfect day for a ride, especially for the middle of winter, with temperatures reaching almost 70 degrees. It felt good to get out and enjoy the unseasonably pleasant weather, particularly in light of the fact that it has been an otherwise harsh winter. The church, the unusual weather and the ride itself made me think about how you should enjoy what you have while you have it, because often it will be gone too soon. 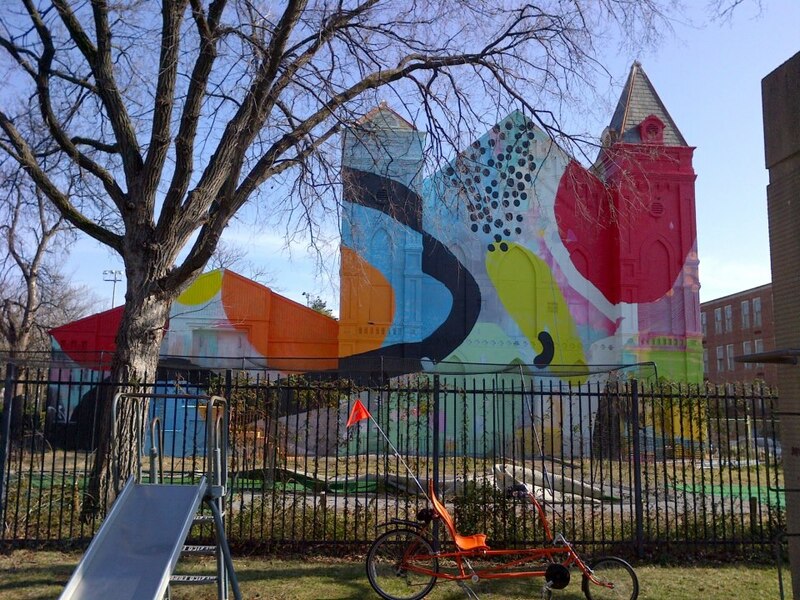 Note: The colorful church building is now the home of Blind Whino, a non-profit arts club and event space dedicated to the principal that art is a catalyst for change in a community, and providing inspiration and motivation for those that encounter its power.